These three dragons are gods from Iphyon. The large dragoness is “Vera”, she is the spring. She’s the daughter of Loraays, the God of Elements. Vera is a euphoric, nice, kind, funny and outgoing dragon. She loves the beauty of nature. The Spring-goddess always carries those two energyballs (which she’s holding with her hands) around with her. Of course, spring is her favorite season, because then she becomes visible for material (normal) creatures, that populate the planet Iphyon. (-in summer, autumn and winter she is invisible). In the drawing she becomes visible – as spring currently begins in the artwork. The other two dragons are lower gods and they always accompany Vera. The pinkish/reddish dragoness is Flora – in spring she tempts the plants to grow with her lovely songs. She’s also carrying an enerygball in one of her claws. Flora is more a silent, a bit shy dragon – but a lovely friend if you get known with her. 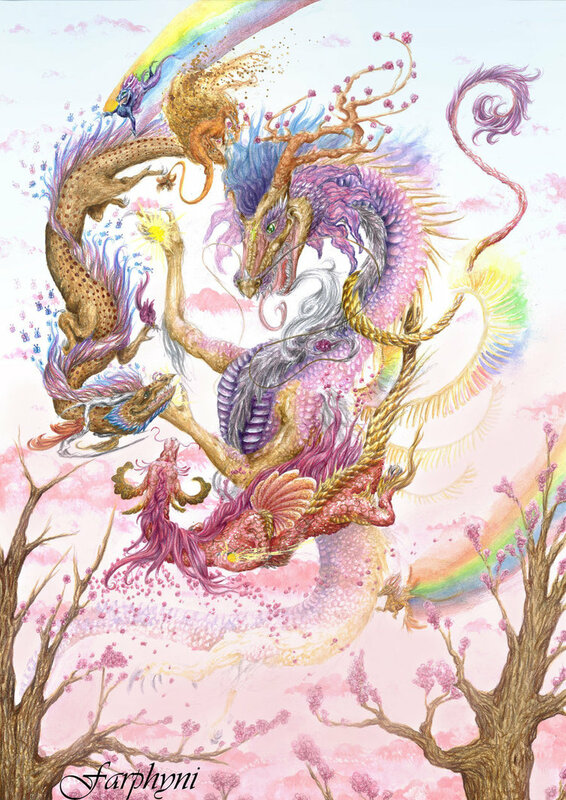 The brown dragon is Floras brother, he is called Fauna. Fauna helps the migrating birds to find home again, he tempts the hibernating animals to wake up and leave their caves and hidings. He is quite the opposite of his sister: talkative, always joking and very confident. There’s a rainbow-dragon and even a pollen-dragon, both also working to bring the spring to Iphyons creatures! Of course Iphyon doesn’t only have a Spring-goddes, but also gods for winter, autumn and summer.